IT graduate or related course; At least 1 – 2 years experience; Hardworking and flexible. Male / Female; Not more than 30 years old; With two(2) years experience in the same field; With pleasing personality. Female; 25 – 40 years old; College graduate of HRM; At least one(1) year experience on the same position. Male; At least 6 months to one(1) year experience. Male / Female; 20 – 30 years old; At least College level; Hardworking; Experience is an advantage. Male; At least College level; With selling skills; With driving skill. Female; Not more than 28 years old; BS Nursing graduate; Experience on the same field is a plus; Computer literate; Must be willing to do admin tasks; Pleasing personality. Male; 30 – 40 years old; Graduate of Hotel & Restaurant Management or any related course; At least 4 years work experience; With strong personality; Computer literate; Knowledge in Housekeeping procedure and Inventory; With good moral character; Can communicate well; Can handle pressure; Can work on a shifting schedule. Male; Graduate of Electrical or Mechanical Engineering; Knowledge in AutoCAD is an advantage; Computer literate; Can communicate well; With technical know-how in building Maintenance; Can work on extended hours. 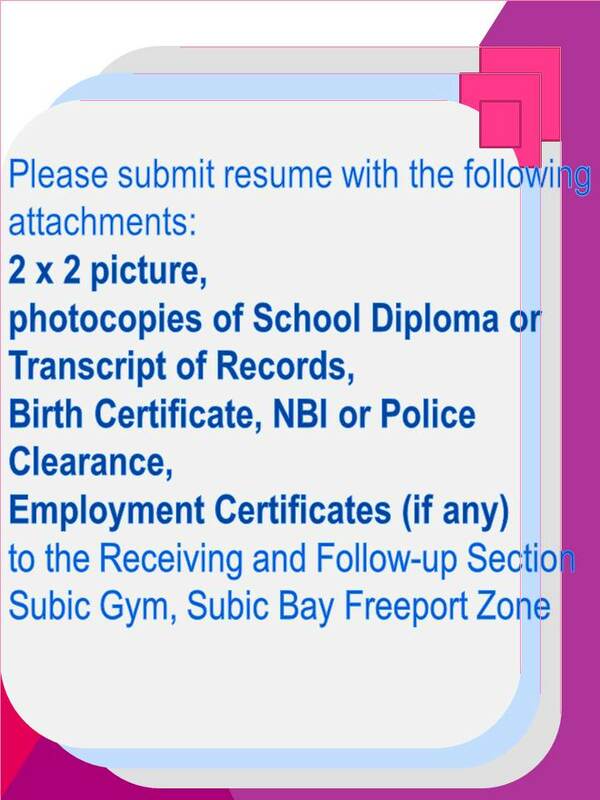 TESDA certified; With at least two(2) years experience. Graduate of BS Industrial Engineering; At least two(2) years experience. Male/Female; Not more than 30 years old; Graduate of any engineering courses, preferably Mechanical or Industrial Engineering; With experience in quality control or quality assurance is an advantage; With normal visual acuity of 20/20; Has good interpersonal and leadership skills; Must have the ability to judge the product systematically; Must be computer literate; Can work under pressure and with limited supervision; Willing to render overtime work.